Hi, everyone! 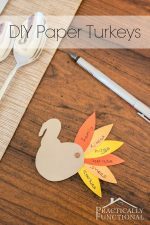 I’m Consie and I blog over at Atop Serenity Hill and I’m excited to be here today to share a super cute and easy fall project with you. Huge congrats to Jessi and family on the new baby! 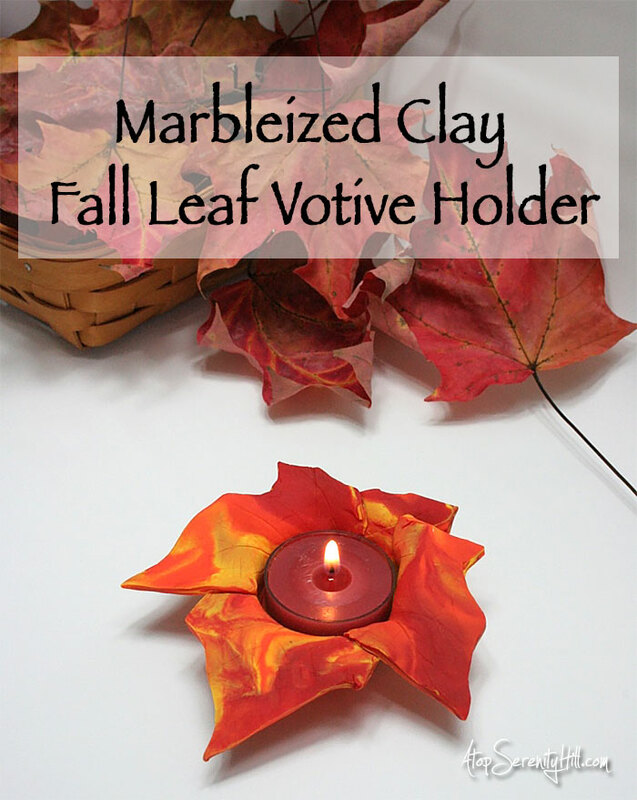 This marbleized clay votive holder was simple to make and would make a great hostess gift for the upcoming holiday. 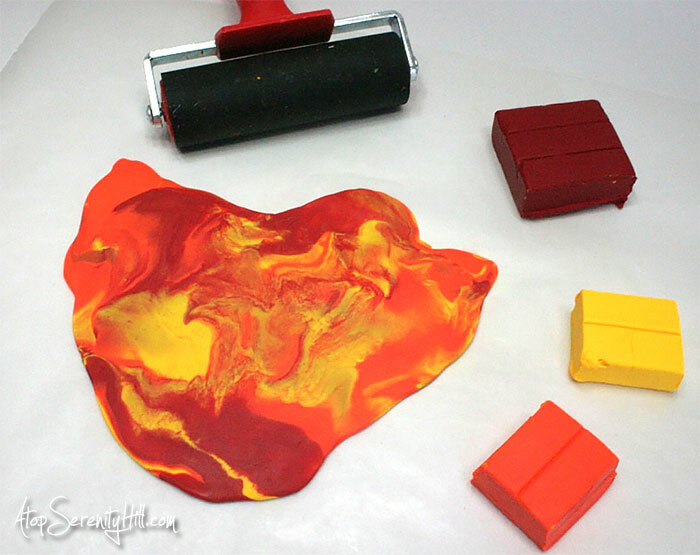 Oven bake clay in red, orange and yellow. I used Sculpey brand. 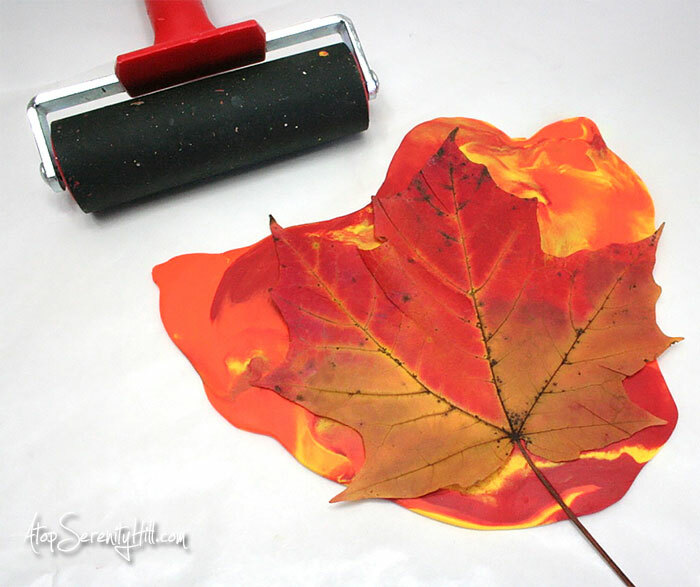 Real or artificial leaves; a paper pattern would also work. The first thing I did was create my marbleized clay. I used 2 parts yellow, 2 parts orange and 1 part red clay and molded them together in my hands. Don’t over-blend the colors! Placing the clay on a piece of waxed paper, I then used a brayer to flatten out the clay to the size of the leaf I was using as a pattern. The next step was to place the back of the fresh leaf on the clay and roll over it with the brayer. I wanted to pick up some of the veining patterns in the clay. 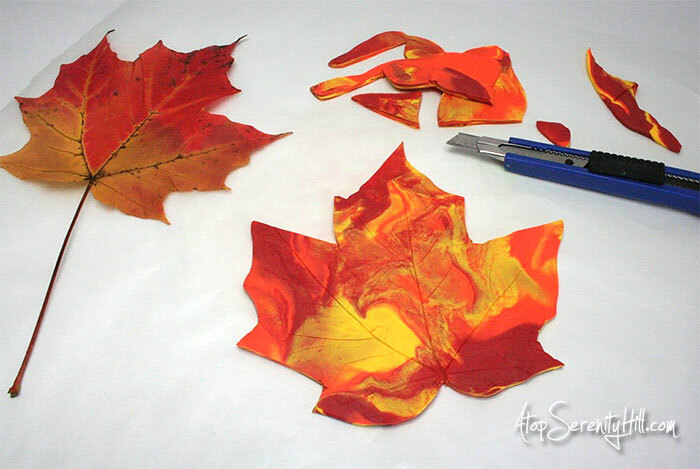 I then used my craft knife to cut out the leaf shape. 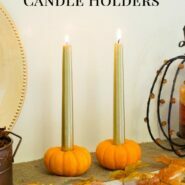 The leftover clay could be used to make beads for another project or just add more clay and remold to create more votive holders. 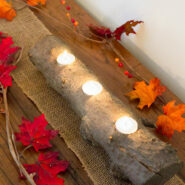 I took my cut out clay leaf and gently molded it around the base of a votive candle. I pinched the overlapped sections together to create a stronger bond with the clay after it baked. 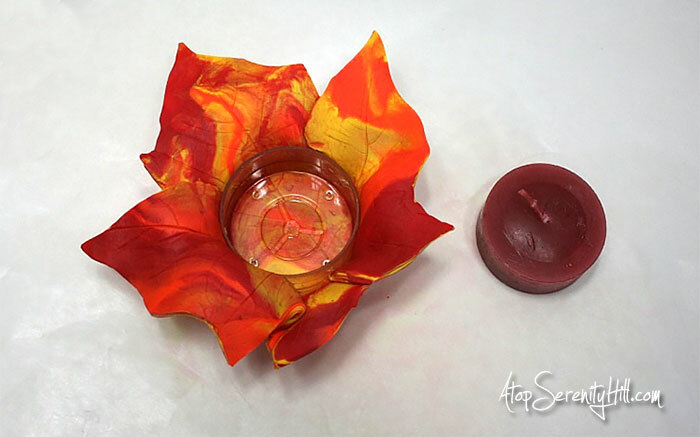 After taking out the votive candle, I placed my clay leaf on a piece of wax paper and then on a baking sheet. Following the instructions on the clay packaging, I baked the clay votive holder in the oven. Always follow the instructions on the clay you are using, but here is what I did: put the baking sheet and clay piece into a cold oven; set oven for 275 degrees; bake clay leaf for 20 minutes; shut oven off and let clay cool completely in the oven. 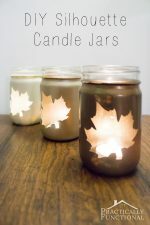 Such an easy project to complete and I love how it turned out! 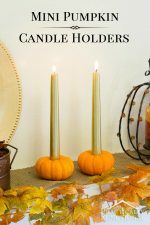 The votive holder would be perfect to decorate a small powder room for the holidays. 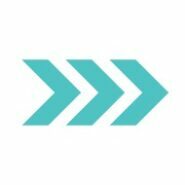 I hope you will give it a try! 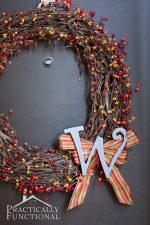 Here are a couple more fall projects for you to check out: Paper leaves and burlap autumn wreath and Falling leaves greeting card. 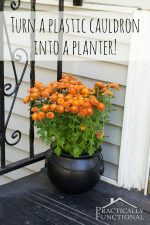 If you liked this project, check out these other simple fall projects! 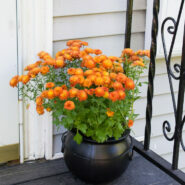 Turn A Plastic Cauldron Into A Planter! « Dear Santa, I Want a Roomba for Christmas!